This month's Six Degrees of the library collection post is contributed by guest blogger Lara. 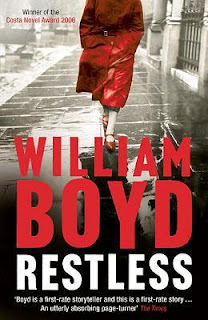 This month, the book club that meets regularly at the Spring Garden Memorial Library will discuss William Boyd's novel, Restless. This thrilling spy novel portrays a fascinating female character who has hidden her World War II-era activities from her family. Boyd's page-turner should make for some excellent discussion on Thursday, November 12th. Restless won the 2006 Costa Book Award, which recognizes excellent authors from Britain and Ireland, and is the only major award to consider children's literature alongside works intended for adults. 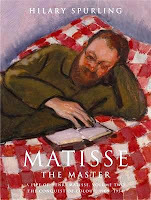 The Costa Book Awards were formerly known as the Whitbread Awards, and the last book to win the Whitbread Book of the Year Award before the name change was Hilary Spurling's Matisse the Master. Using material from private archives and lots of family letters, Spurling evokes a more complete portrait of the master painter than has ever been available before. Spurling enjoys writing about the lives of creative people, and the previous biographer to win the Whitbread award also made her mark by authoring accounts of famous authors. Claire Tomalin, winner of the 2002 Whitbread, has written biographies of Jane Austen, Charles Dickens, Thomas Hardy, and Mary Wollstonecraft. It was her account of Samuel Pepys: the unequalled self, however, that garnered her the Whitbread. Tomalin apparently studied at Newnham College at the University of Cambridge. Iris Murdoch is another alumna of the College, having studied there as a postgraduate student of philosophy, and is well remembered for many novels and writings with elements of philosophy and morality playing important roles. Several of her works have been honored with major awards, including the 1974 Whitbread for The Sacred and Profane Love Machine, and the 1978 Man Booker prize for The Sea, The Sea. Murdoch's writing is full of charged emotions, existential crises, and unexpected events that impact every day life. Nine years after winning the Booker, Murdoch was made a Dame Commander of the Order of the British Empire, an honor she shares with fellow writers like Agatha Christie and A. S. Byatt (another alumna of Newnham College!). Byatt won the Booker in 1990 for Possession, and her recent novel The Children's Book has been very well received. The story takes place before World War I, at a time when the concept of childhood was changing dramatically, and the several children in one family become caught up in movements like feminism and socialism. As the Great War begins, the mother of the family remains caught up in her fairytale world of writing stories during the time of J.M. Barrie's Peter Pan. The line between adulthood and childhood becomes blurred as the world falls apart around the characters. 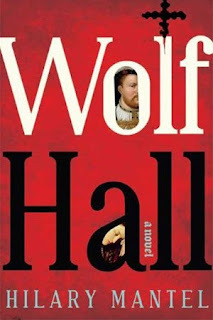 The Children's Book was shortlisted for the 2009 Booker, but when the prize was announced on October 6, it was Hilary Mantel who won this year's prize, for her novel Wolf Hall. Mantel writes psychological, historical fiction with links to the occult and darkly comical themes. Her 2005 novel, Beyond Black, was also nominated for the Booker Prize as well as the Orange Prize for fiction. I really enjoy reading the Six Degrees of the Library Collection posts. However, since there's never any mention of the selection process, I wonder how the two authors to be connected in six degrees are chosen. What I would really like to see is if The Reader's readers could choose the authors! For example, if I were to suggest say J.R.R. Tolkien and, oh, Salman Rushdie, can you connect them in six degrees or less? Now THAT would be a challenge! I love this challenge! I'm working on it. Stay tuned!